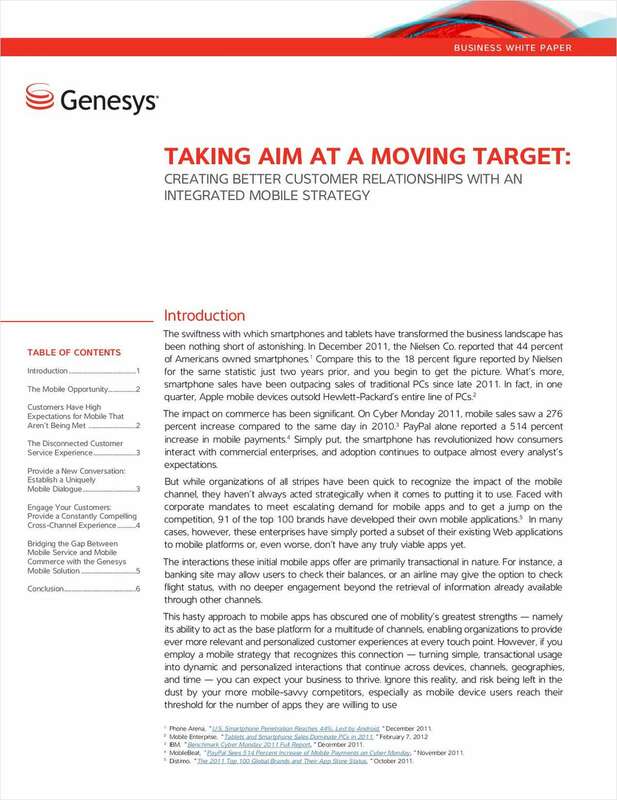 "Taking Aim at a Moving Target: Creating Better Customer Relationships with an Integrated Mobile Strategy"
Free White Paper: "Taking Aim at a Moving Target: Creating Better Customer Relationships with an Integrated Mobile Strategy"
The swiftness with which smartphones and tablets have transformed the business landscape has been nothing short of astonishing. But while organizations of all stripes have been quick to recognize the impact of the mobile channel, they haven't always acted strategically when it comes to putting it to use. By submitting this content request, I have legitimate interest in the content and agree that Genesys Labs, their partners, and the creators of any other content I have selected may contact me regarding news, products, and services that may be of interest to me.